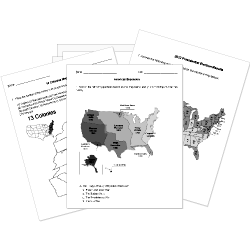 You can create printable tests and worksheets from these Grade 10 American Imperialism questions! Select one or more questions using the checkboxes above each question. Then click the add selected questions to a test button before moving to another page. The mysterious explosion of the U.S.S. Maine in Havana Harbor helped push the United States to declare war against Spain. Emilio Aguinaldo led the rebellion against American rule in the Philippines.